Gigaom publishes a report about how wearables and other “quantified self” tools are increasingly being used to track health, wellness, and productivity in the workplace. Fast Company rounds up the best office products of the 2014. 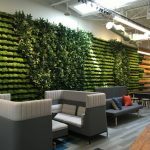 Commercial Building Products explores the “open office blues”.